Act I Bert, a man of many professions, introduces the audience to Cherry Tree Lane ("Chim Chim Cher-ee/Cherry Tree Lane- Part 1"). Number 17 is where the Banks family lives: George and Winifred Banks, their two naughty children Jane and Michael, their cook, Mrs. Brill and their odd-job man, Robertson Ay. Things are not going well, for Jane and Michael are out of control and as the show starts, their latest nanny, Katie Nanna, storms out. After that, Mrs. Brill and Robertson Ay complain about living in a "madhouse." The children decide to write the advertisement for a new nanny ("The Perfect Nanny"), but George Banks has a very different idea of what constitutes the perfect nanny and he tears up the piece of paper and throws it in the fireplace. 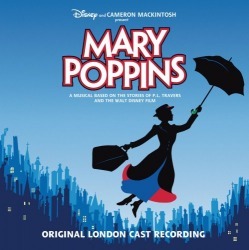 Within moments Mary Poppins arrives and takes charge of the Banks children, having every confidence in her own qualifications and merits ("Practically Perfect"). The children return home in high spirits, unaware that things have gone wrong for their father. Unknown to them, George's decision to reject Von Hussler has cost the bank dearly, and he is suspended without pay. George explodes with rage at the children and they are sent to the nursery. Reacting to her father's outburst, Jane flies into a fury, ignoring Mary Poppins' words of warning about controlling her temper. The frightening consequence of her anger becomes apparent as Jane and Michael's toys take on a life of their own and teach the naughty children a lesson with a pretend trial. With plenty of witnesses, including a Jack-in-the-box as the "surprise witness," the children are found guilty and the apparitions collapse as Mary Poppins returns ("Temper Temper"). Beginning in 2009, a new song called "Playing the Game" replaced "Temper, Temper" in all of the productions. In this song the toys also come to life, but Mary does not leave the room and the children are instead taught how to take better care of their toys after fighting over them. Act II Unfortunately, in a misguided attempt to please her husband, Mrs Banks arranges for his childhood nanny, Miss Andrew, to take over from the suddenly departed Mary ("Cherry Tree Lane (Reprise)"). At the very sight of her, a terrified Mr. Banks flees, exclaiming "the Holy Terror!" To everyone's shock and dismay, Miss Andrew is a brutal and cruel tyrant, rejecting any notion of a "spoonful of sugar" in favor of her own terrible elixir ("Brimstone and Treacle Part 1"). Mary (Laura Michelle Kelly) and Bert (Gavin Lee) during "Step in Time". Also hiding in the park is George, who is depressed over his supposed lack of achievements ("Good For Nothing"). Searching for him is Winifred, who at last understands her husband and the damage that was done to him by Miss Andrew ("Being Mrs Banks (Reprise)").